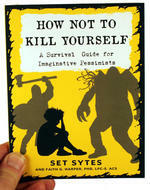 Set Sytes was born in the misty, Arthurian woods of England and was raised by bears. He grew up learning how to do and be many things at the same time, including slaying monsters, rescuing damsels in distress (who turned out to be neither in distress nor, in fact, damsels), and commanding great armies (the strategy involved inevitably being "everybody charge at the enemy"). As the Real World struck with a calamitous clang, Set was found wandering around in the desolate aftermath, completely uncertain about what was now expected of him. He faffed and stumbled around for an embarrassingly long time (sometimes failing quite spectacularly) and then finally turned his hand to the only thing he remembered being any good at as a kid: writing. He was relieved to break the curse of never having finished anything in his life, when he finished his first novel. Which was okay-ish. Set has since authored many stories of darkness and weirdness and flights of fancy, including the sci-fi/fantasy/western novel WULF, the YA pirate fantasy India Bones and the Ship of the Dead, the thoroughly twisted dystopian thriller Moral Zero, and the fantasy/horror short story collections of Faces in the Dark and Born to be Weird. Set requests politely that you don't put onions anywhere near his food.